Chris Martenson writes: At PeakProsperity.com, we pride ourselves on providing fact-based context to breaking important events. Within 72 hours of the Japan tsunami in 2011, we had analyzed the situation and concluded with high probability that three core meltdowns had occurred at the Fukushima nuclear plant. While it took years for officials to finally admit to the full extent of the crisis, history has validated our initial analysis. How did we get it right? By using a science-based approach grounded in observation, deduction and a healthy skepticism of what the "experts" in charge claimed. We also went to great lengths to educate our readers about the science in play, explaining in detail how radioactivity and contamination differ, the health risks from such a nuclear accident, and what concerned folks could do to remain as safe as possible. When California's authorities suddenly reversed course and scrambled to evacuate nearly 200,000 residents living downstream of the Oroville dam, within an hour, we had released an analysis of the situation, explaining the critical differences among the primary spillway, the main dam, and the auxiliary spillway. By 10:00pm that same Sunday night of February 12th, we had shared a series of updates with schematics, images and conclusions that was more complete, accurate and hysteria-free than any other news source we could find at the time. By the next morning, we had located and interviewed one of America's top dam experts, who provided an absolutely spectacular assessment of the situation at Oroville. That podcast has been listened to by nearly 50,000 people at this point, including residents of Oroville who have used its insights to determine whether or not to return home at this time. And on top of all this, our own community began filling in the blanks with their expertise. One community member, an emergency worker deployed to the dam earlier this week, has been providing us with valuable insider information that state officials have resisted making public. The reason I'm relating all of this now is because of the instructive lessons involved. It’s worth noting that communications from officials in Oroville transitioned from a steady, repeated stream of “Everything is fine. There's nothing to worry about” to suddenly “Run for your lives!” within an hour. Of course, the 188,000 people living downstream from the dam were caught off guard by the mandatory evacuation order. Many left with none of their possessions, only to get hopelessly caught on clogged roads. It was a time of panic and disorder, with no one seemingly in control. The main lesson from Oroville -- or Fukushima, or Katrina -- is that governments do a poor job of relating accurate information to their citizens when big threats are involved. Part of that is likely due to a desire to avoid stoking fear. Part probably due to politics and bureaucracy. And part probably due to plain old incompetence. Regardless of the cause, it means that the public -- even the vigilant ones -- suffer information deficits when it matters most. Simply put, the authorities do not share all the facts necessary for making informed decisions. Why is why our longstanding advice has been a straightforward call to 'trust yourself' when assessing crisis risk. In most cases, good old-fashioned common sense and a little sleuthing will get you far closer to the truth, and faster, than 99% of your peers who are relying on being told what’s happening by those in charge. In most cases, the information you need to assess the truth will be right there, hiding in plain sight but always obvious in retrospect. This means it’s also available to you in real-time, providing you're willing to trust your own eyes and you know where to look. Which brings us to one of the truly great risks we're facing today. One with much more destructive potential than a single failed dam but, like Oroville, one the authorities are desperate to keep us in the dark about. We are now living through the mother of all financial bubbles. We've been living with it so long now that we have to take three giant steps backwards to even detect its broad outlines. As a reminder, a bubble exists when asset prices rise beyond what incomes can sustain. Florida swampland in the 1920’s, tech stocks in the late 1990s, or Toronto real estate today -- all are fine examples of this. The US government and the private banking cartel known as the Federal Reserve, in cahoots with a very compliant and complicit mainstream media, are doing everything in their vast and considerable power to convince us that we are living in an golden era of risk-free prosperity. And that tomorrow will be even better. Now, regular readers of PeakProsperity.com's reports will know there's a mountain of evidence contracting this. But it's critical to understand that this is the same public perception management style as we've recently seen at Oroville: Deny, deny, deny... and then finally admit the obvious. So let’s take those three giant steps backwards and see if we can spot the flaw in the ‘everything is awesome!’ meme that the Fed et al are trying to paint for everyone by flooding the “markets” with so much thin-air liquidity (between $150-$200 billion a month) that nobody has any clue what anything is truly worth anymore. Giant Step Backwards #1: Infinite growth is impossible. This is such an easy concept that I'm continually surprised at how poorly appreciated it is and how much resistance it receives when raised. But it works like this: the earth is a sphere and therefore has a defined surface area and a defined amount of resources available for use. The availability of these resources ranges across a spectrum from dense/concentrated on one end to dilute/useless at the other. Humans have already extracted and consumed most of the easily obtainable stuff. Now it gets harder. Regardless of the economics of these resources, they are finite. And as our economic requires resources to function, if we want our economy to grow from here, that means consuming more resources at a faster rate then we have been. If resources are finite, then growth will one day prove finite, too. This should be utterly, blindingly obvious to everyone. But it’s not, apparently. The Federal Reserve and the central banks in other nations are unified in their call for more economic growth, always and forever. That’s plan A. There is no plan B. Giant step backwards #2: You can’t print your way to prosperity. History is replete with the failed attempts of nations to print their way to prosperity. The pursuit operates on the same principle as alchemy: trying to get something for nothing. It has invariably and always ended the same way. In tears. At first it, issuing more currency feels good because those closest to the money printing get stinking rich while doing practically nothing. As that trickles down, everybody initially feel smart and wealthier. Well, not everybody; but those running the system sure do. After a while, though, all that feel-good activity is revealed as a fraud. It turns out prosperity wasn't printed, instead it was redistributed. From one party’s pocket into another. And in most cases, from poorer pockets into those of the already-privileged. The same is happening today with the "thin air" money printing being conducted by the world's central banks. We are now living with one of the most extreme wealth gaps in US history, with the top 1% (really, the top 0.1%) owning a greater percentage of the nation's wealth than they ever have. But it's even more nefarious than that, because the Fed is not simply stealing from today's public; it is also stealing the prosperity of future generations. When the party being stolen from hasn't been born yet, it can't fight back. In short, you cannot print your way to prosperity. Yet somehow we've forgotten that. And we're dooming ourselves (and our children and grandchildren) to becoming serfs in the process. Giant step backwards #3: You can’t grow your debts faster than your income forever. This, too, should be completely obvious. You know perfectly well it holds true for your personal life or your business, if you have one. And it’s equally true for a nation, which is simply an aggregation of individuals and businesses. But somehow this simple truth has been either forgotten or deliberately ignored by today's economists and politicians. 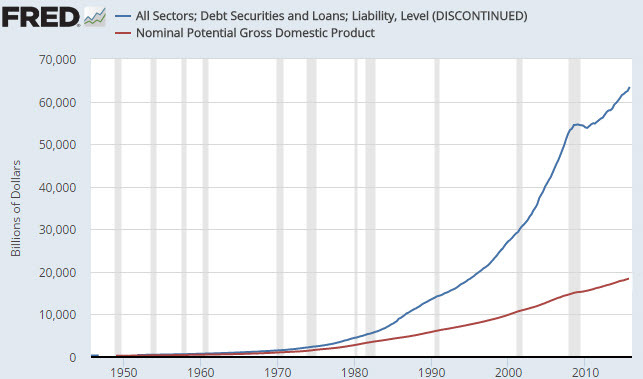 Our grand experiment in debt-based fiat currency -- unbacked by anything tangible, like gold -- began on August 15th, 1971 when Nixon unilaterally broke the Bretton Woods agreement and forced the entire world off of the gold standard. Not that the world minded much, because this then meant that politicians and monetary hacks everywhere could ignore centuries of economic lessons and begin making exorbitant promises by printing currency like mad. 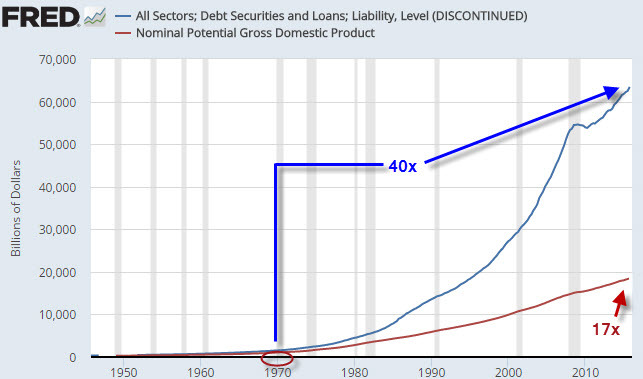 The giant step towards monetary (and debt) expansion this represented is clear to anybody who can read a chart. And, it should be noted, a lot of that GDP ‘growth’ is the byproduct of borrowing and spending money we don’t have on things we don’t need. Said differently: the debts will remain during any serious future economic downturn but the GDP that is fraudulently based on excessive rates of borrowing will vaporize as if it never existed in the first place. That, my friends, right there is the very definition of unsustainable. If something cannot go on, it won’t. But the Federal Reserve, under the leadership of a pure academic like Janet Yellen, cannot conceive of any approach other than perpetuation the same system that has been in place while she's built her career. The Fed is desperately seeking to keep the status quo in place, praying that somehow things turn out OK, and clearly scared to death behind the scenes. But, just like the officials at Oroville, when the cameras are on her, Yellen smiles and tells us that all is well. The Fed has printed as much money as it has dared for the time being. It has since handed the baton over the ECB, and the Bank of Japan, who have stepped in to keep the wheels of the world's debt production well-greased. Around and around the baton gets passed. And we're told by our government and media that this is all in our best interests. However, the only thing these central banks are truly doing is stealing from savers and the elderly today, and pretty much everyone tomorrow. What have they done with the trillions in "thin air" currency they have printed up? They handed them to the big banks, to speculators and the already wealthy. Which should come as little surprise. These are the people they count on for their high-status jobs, as well as the big payouts awaiting them when they return to the private sector. In the meantime, they’ve blown the Mother Of All Financial Bubbles. 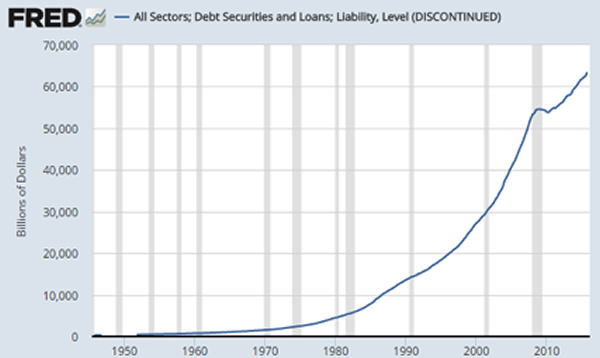 This is primarily a bubble in debt (i.e., the bond market). But in its making, new bubbles in real estate, stocks and a whole slew of other asset classes were created. When these bubbles burst, and they must, it will be a massively destructive event. There will literally be nowhere to hide from the repercussions. You simply cannot count on anyone in power giving you anything like timely warning or useful advice in advance. You need to find accurate, trustworthy indicators on your own, and then decide how you're going to position yourself, your loved ones, and your wealth accordingly. In Part 2: How Bad Will It Get? we detail the tremendous scale of the losses that will result when this Mother Of All Financial Bubbles bursts. It will be a traumatizing time for society, and many, many people will see their wealth vaporize. The key objective at this time is to position yourself for physical and financial safety. For those who do will be in a position to prosper greatly, as well as offer much-needed support to others, when the coming reset arrives.